I’ve spent the last 5 weekends hiking or working on the Buffalo River Trail. It wasn’t a goal, it just kinda happened. Last weekend was backpacking in the upper river area, this weekend it was backpacking in the middle area – from the Wollum Campground to the US-65 bridge. What a difference a week makes for weather! Last weekend an overnight low of 67, this weekend a low of 21.A couple friends from the Kansas City area drove down Friday for an early afternoon meet. We started at the Woolum end, thinking it made sense to get the water crossings done at the beginning of the trip instead of possibly finding ourselves stranded at the end (or forced into an overly-risky situation). Here they’re standing on the road looking at the ford across the Buffalo (flowing right to left) and the road on the other side. Richland Creek is flowing straight at us in the left center. I only waded into the Buffalo about 20 feet here before the water was crotch-deep and getting deeper so we decided this was not a good place to cross. 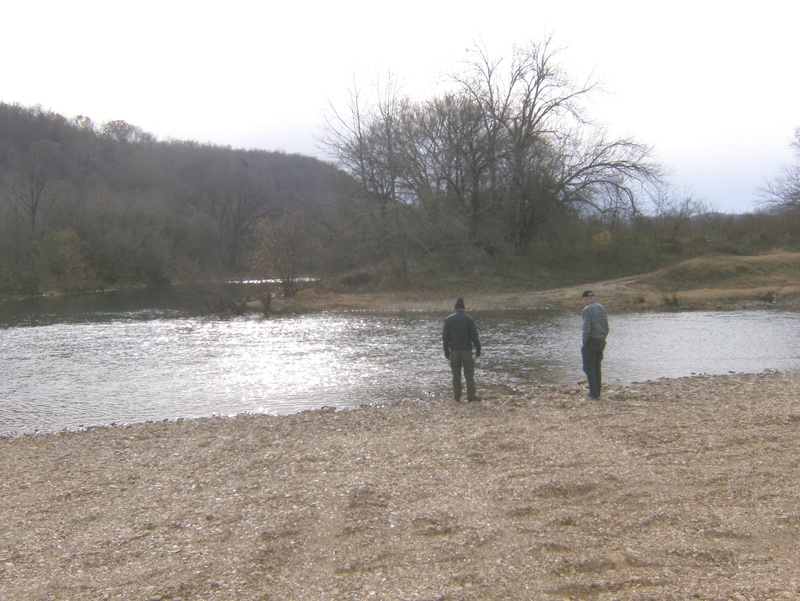 We went upstream about 50 yards to a place where the ripples suggested shallower water. The current was stronger here but the water was only about knee-deep so it was not a big deal. Richland Creek was obviously too deep to cross right here at the mouth so we headed a couple hundred yards upstream on a dirt road. The road eventually turns right (west) to a gate while we turned left on a faint trail through a little brush to the creek. The water here was only about ankle deep and we might have been able to rock-hop across nearby but we were already wearing our creek shoes so we waded. In hindsight, there might have been places downstream of the mouth of Richland Creek where we could have crossed the Buffalo and skipped the Richland crossing altogether. I’ll explore that possibility next time! We dried our legs and feet, zipped the pant legs back on, put on the socks and boots, got the pack squared-away and off we went, heading north on a horse trail back towards the Buffalo. After a couple minutes we arrived at the post that marks mile 0 of the BRT, turned east and we were finally on our way. After crossing a short stretch of bottom land we headed up the side of Point Peter Mountain, gaining about 400′ before leveling out and passing a couple old home sites and then dropping into the Ben Branch drainage. It was getting dark and starting to rain so we stopped here for the night after about 3.5 miles. After eating a nice hot meal, I think we were all in bed by 7:30. The patter of light rain on the tent always makes it pretty easy to fall asleep. We were expecting a low temp near freezing but it was about 43 degrees instead when we awoke and unfortunately it wouldn’t warm-up much Saturday. The hike began with a climb to Dave Manes Bluff and the first of many scenic overlooks from the many following bluffs. Saturday ended about 8 miles later on a ridge above Arnold Bluff. The skies were clearing with a bit of wind from the north but we had a nice fire to ward off the chill. Sunday started off sunny and 21 degrees but became a bit hazy by the time we got on the trail so it never did warm up much that day either. We descended into Arnold Bend, passing the Arnold cemeteries – both old and new – and the old Arnold homestead. 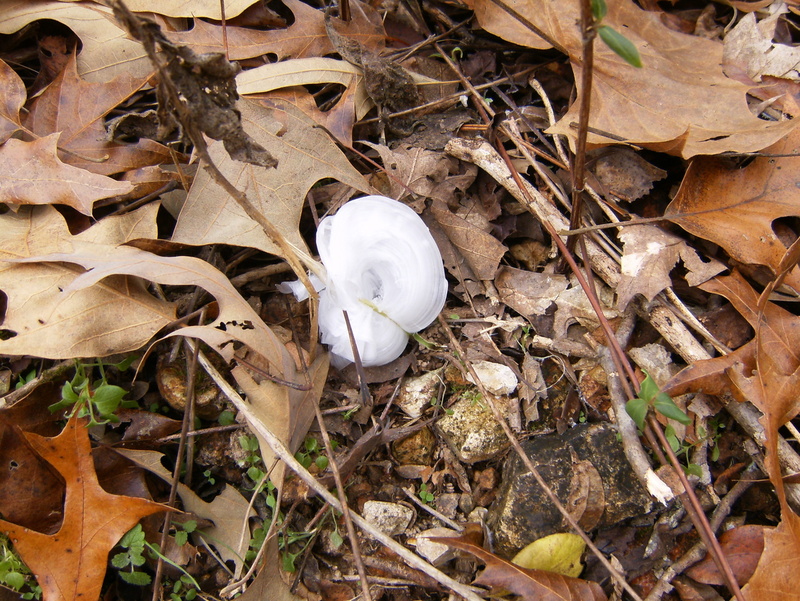 Frost flowers were abundant. The Calf Creek drainage opened below on our left and we could see quite a bit of water flowing. The map indicated we would be fording it at the next bend and we weren’t looking forward to doing it in those temps but the ford was dry – the entire creek had disappeared into the underlying rock as far as we could see up- and downstream there. The trail continued across a large hay field before turning to climb a hill into the Tyler Bend area, topping at the Collier Homestead and continuing east on a ridge for a couple miles before a short descent to a creek crossing at the south end of the US65 bridge. We walked across the bridge on the pedestrian sidewalk , crossed the highway to the parking lot, and we were done. This section of the BRT has some great scenery though much of it is shared with equestrians and that was pretty disappointing because of the damage they’ve done and the beer cans they’ve left behind. As far as sources of drinking water, Calf Creek looks pretty reliable (but not at the ford) and we had a temporary-looking trickle crossing the trail in Whisenant Hollow but everything else was dry. If you have to, there are several opportunities to detour out to the river to slake that thirst. 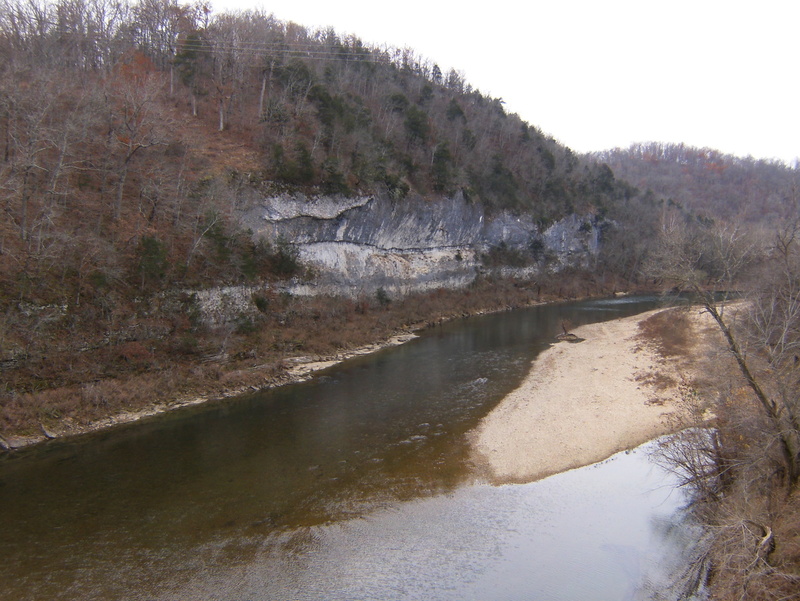 I’ve now hiked about 43 of the 63 miles of completed Buffalo River Trail and expect to complete it before summer. 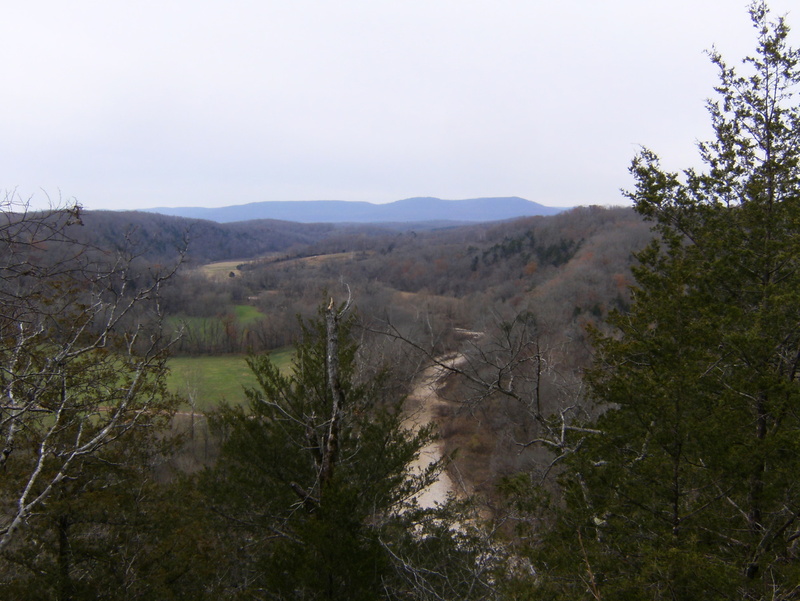 I’m also trying to complete the Ozark Highland Trail so I will probably have no trouble keeping busy.